Yachting & Boating World: Sailor Roger Pratt was murdered onboard his yacht in St Lucia earlier this year. The widow of yachtsman Roger Pratt is concerned she could have to wait up to five years before the four men accused of his murder go on trial. In an interview with the Telegraph, Margaret Pratt, 60, describes how she’s become increasingly frustrated with the “delays in the judicial process” in St Lucia, despite an “impressive” response to the case initially. 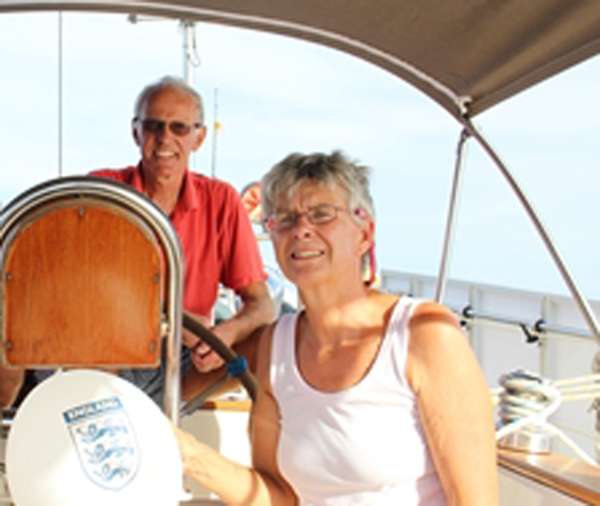 Mrs Pratt and her 62-year-old husband had been moored in the commercial port of Vieux Fort when intruders attacked them on board their 41ft yacht Magnetic Attraction in January. Mr Pratt died trying to defend his wife and Mrs Pratt was later treated in hospital for cuts and bruises following the incident. Speaking earlier this week, she said: “Initially it was very impressive, the Royal St Lucia Police really put a lot of effort into getting evidence and preparing the case. In a statement, the Office of the Director of Public Prosecutions (DPP) denied that the legal process had “stalled” but did admit that they were dealing with a “backlog” of cases. “While I understand Mrs Pratt’s frustration, one has to get an understanding of how the criminal justice system works and take into account the available resources,” they said. “The office of the DPP has the responsibility to prosecute criminal cases before the courts. Currently there is a total of over 2,000 cases in the high court and these cases are dealt with according to antiquity. Since the death of Mr Pratt in January, the four men charged with his murder have appeared in court for a number of pretrial hearings and are due to attend a hearing today (31 October) regarding robbery charges. The defendants were committed for trial over the murder charges on 17 October and the matter was adjourned to 6 February 2015 for the crown to report on the indictment. Motorboat & Yachting: BMF Scotland, RYA Scotland and Scottish Canals are all involved in the new tourism drive. The BMF hopes to turn Scotland into a “first choice” destination for boatowners by 2020, as part of a new tourism campaign. To this end, a group of nine industry bodies, including RYA Scotland, Scottish Canals, Sail Scotland and VisitScotland, have drawn up a new Marine Tourism Strategy for Scotland. As part of their research, the group found that the boating industry contributes £366million per year to the Scottish economy. However, it is believed that this number could be increased significantly and the report calls the Scottish marine industry a “sleeping giant”. The overall aim is to transform Scotland’s reputation as a boating destination by 2020, with an emphasis on high quality and value for money. The report claims that Scotland has “some of the world’s most beautiful and varied boating waters”. Examples given include Portavadie Marina (pictured above), which was extensively upgraded last year and benefits from 70ft berths and deep waters, thanks to its man-made lagoon setting. Boat owners are encouraged to contribute to the Marine Tourism Strategy for Scotland by completing BMF Scotland’s online survey. To read our feature on why moving your boat to Scotland could be the best decision you’ve ever made, pick up the December edition of MBY, which is out 6 November. Motorboat & Yachting: The 2014 edition of the Biograd Boat Show has been hailed by organisers after more than 14,500 visitors flocked to the Croatian town. The 16th annual Biograd Boat Show drew to a close on Sunday (26 October) with the organisers celebrating a record-breaking success. The four-day exhibition, which recently joined the International Federation of Boat Show Organisers, had a record of 275 exhibitors from 13 countries. A total of 291 vessels were exhibited, ranging from 2-20m, including over 100 used boats. The show was extremely well attended, with over 14,500 visitors boosting the usual 5,000 population of the nautical town of Biograd, which has 1,500 registered vessels. Exhibitors such as Bavaria, Absolute, Linssen, Targa and Riva were present, while local boat builders Mirakul and SAS-Vector promoted Croatian boatbuilding. But it was Elan who exhibited the largest number of boats, with twelve vessels from the Croatian manufacturer at this year’s show. The show has greatly increased in size to include new features such as the Yacht Charter Information Centre, providing information for visitors on Croatian yachts for charter. Meanwhile, the latest models of recreational vehicles and mobile homes were displayed in Camping Corner. Renowned for offering a great boat show experience, the intimate town of Biograd is proving increasingly popular. Local hotels, restaurants and bars opened their doors to the nautical visitors, offering artisan food and drink from the region. Particularly appreciated was the pontoon bridge linking the main marina with Marina Kornati West, allowing guests to pass between them while afloat. Free tours for visitors were offered on Biograd’s 36m event ship Nada, as well as RIB rides, and semi-submersible submarines. Live music and other entertainments continued into the early hours, with many visitors travelling from neighbouring European countries to attend. With tickets costing under £5 a head (free for children under 14) and UK flights direct from London Stanstead, the international draw of the Biograd Boat Show looks set to increase next year. Motorboat & Yachting: The tail end of Hurricane Gonzalo provides a testing afternoon for the Princess 43. We’ve done it, we have finally tested the Princess 43. It’s been on the hit list for some time and with our colleagues in the marine press showering it with praise, we thought it was about time we had a go. The one we tested was a bit special, too. Princess now offers the 43 with a pair of Cummins 6.7-litre 550hp engines, our test boat being one of the first to have this option. This gives you 230 extra horsepower over the standard Volvo Penta D6 435s but, more importantly, around 1,000lb/ft more torque in total. In the sloppy sea conditions we had in the wake of Hurricane Gonzalo that torque was very welcome indeed. The big swell and foaming crests had us down to the 15-knot trudge that planing boats usually hate but huge dollops of torque meant hoisting the boat out of troughs and up the back of waves was comically effortless. In calmer water, the pick-up from standstill was sensational and would leave a fair number of rather shouty sportscruisers staring at the 43’s transom. Although, technically, the 43 is a new model it is also a development of the 42, a boat which Princess made over 300 of. So it’s fair to say it is good at building these things by now and that shows in the execution of the build and attention to detail. It is an exceptionally well-rounded product. The two cabin, two bathroom layout is traditional and tried and trusted but still works well, even in an age when the competition are fitting full-beam master cabins to boats of this size. Although the boat has been around for a while in one guise or another, this proved to be an intriguing test both thanks to the weather and the uprated engines. Read the full report in a future issue. Pratical Boat Owner: ‘Maintaining the status quo is not an option’, says Guernsey Harbours director. Guernsey Harbours will undergo an £80million overhaul over the next 10 years to ensure it remains ‘fit for purpose’, it has been announced. The self-financing scheme needs to come from new funding and includes proposed changes to pricing at St Peter Port and St Sampson’s. A £110million hydrocarbon supply facility to be built at St Sampson’s has also been announced, although this funding has been ring-fenced by central government. He said: ‘We all accept that investment is needed to upgrade our tired harbours and that our marinas are amongst the cheapest in the UK: however, we don’t have the facilities here to justify higher prices. A #MyHarbours initiative has been launched to enable harbour users and islanders to have their say on the proposals. An online survey will run until 17 November, 2014. It contains 18 questions and should take no longer than 10 minutes to complete. Guernsey Harbours expects to publish its recommendations in the March 2015 Billet d’Etat for debate by the States of Guernsey on 25 March 2015. A series of user group meetings and drop in sessions for the public will be held between now and the end of November to gather as many views as possible. Motorboat & Yachting: German boat show Hanseboot in Hamburg has enjoyed a bumper opening weekend and has reported strong visitor numbers for its opening weekend (25-26 October). The German show, which is in its 55th year, saw around 24,000 visitors pass through its doors on the first two days alone. The event runs at the Hamburg Messe centre until Saturday 2 November, and this year’s theme is ‘Northern Waters, Northern Lifestyle’. Boats on show at the event range from eight to 56 feet, with larger craft on display at the nearby City Marina, which can be reached by a free shuttle bus service. Highlights include the Fairline Targa 44, which is capable of 38 knots, and the Elling E3, which is worth upwards of £530,000. Yachting Monthly: A marshland marina is up for sale at just under £2 million. Bridgemarsh Marina on the rural River Crouch in Essex has nearly 200 berths and the freehold of the river. Motorboat & Yachting: Fairline has announced that it is gearing up for a new product range, following the appointment of two senior engineers. British boatbuilder Fairline has dropped a huge hint that it will be launching a new range of boats in the near future. Announcing the appointment of two senior engineers today (24 October), the company claimed that it is preparing for “an extensive new product introduction programme”. Fairline was one of the few major manufacturers not to launch a brand new model at last month’s Southampton Boat Show (12-21 September). However, the appointment of Stefan Whitmarsh as head of engineering and Ben Harrison as engineering manager suggests that something new is on the way. Mr Whitmarsh in particular has previous with new launches, as he was project manager for the launch of the first Sunseeker 155, Blush. Motorboat & Yachting: RYA members can get £8 off tickets to the London Boat Show, where the RYA will be running its Active Marina Experience workshop. With a little over two months to go until the 2015 London Boat Show (9-18 January), the RYA has started to firm up its plans for the Excel Centre boating extravaganza. The boating organisation has confirmed that its members will be able to get an £8 discount on the standard and preview day entry price of £20 per adult. For 2015, the RYA will be exhibiting on stand D016, where showgoers can get advice and information about all aspects of boating. Next year’s show will also see the return of the Active Marina Experience workshops, which offer top tips from expert instructors and a chance to refresh your boating knowledge. Finally, the RYA members’ lounge will also be continued, with the Platinum Suite offering an exclusive area for members to relax with a drink and escape the crowds. Advance tickets for the 2015 London Boat Show are on sale now, starting at £10 per adult for Monday, Tuesday or Wednesday tickets. Under 16s go free and concessions are available for over 60s and group bookings.